SANDY — Dixie owned Alta for the first 25 minutes Friday night. And then things went very wrong for the Flyers. 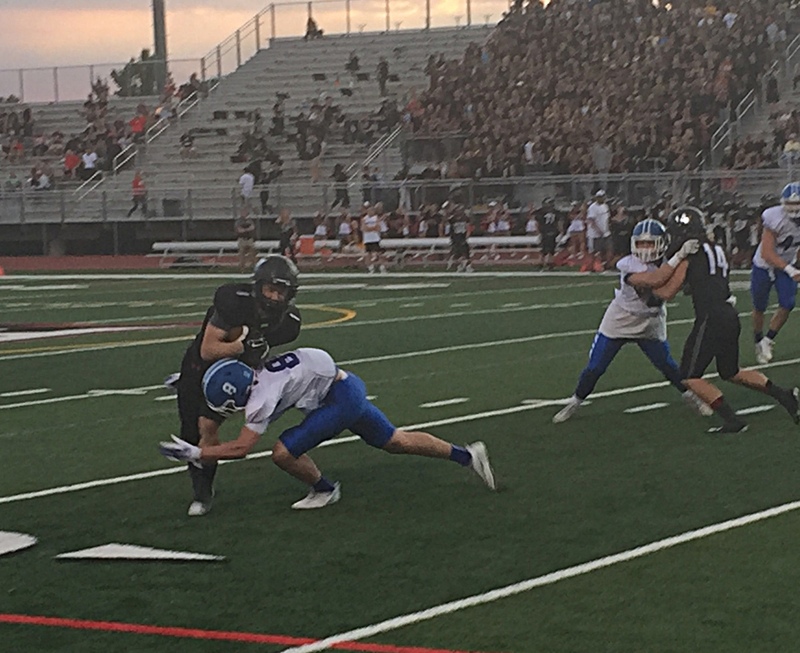 Dixie crashed and burned hard after largely dominating the first half and taking a 14-0 lead early in the second half as the Alta Hawks scored 35 consecutive points to close out the game, 35-14, Friday at Alta High School. Dixie played opportunistic defense in the first half, stopping Alta twice on fourth down and causing two turnovers. Dixie’s Ammon Ah Quin put the first points on the board with a 4-yard rush with 11:29 left in the second quarter. The Flyers then struck again on the first offensive play of the second half when Jacob Barben found Hobbs Nyberg for an 80-yard TD strike. Things changed fast against the Flyers, though. Alta then scored in four plays when Will Dana found wideout London Rockwood open in right corner of the end zone for a 12-yard touchdown. Dixie was stopped on the ensuing possession on 3-plays-and-out and Alta responded as stud tailback Josh Davis needed one play to crank off a 56-yard scamper. Dixie again went 3-and-out, then forced a fumble as Alta drove into the red zone as the third quarter ended with the score tied at 14-14. Ultimately, in the final stanza, Dixie was unable to move the ball, just as Alta seemed to find its rhythm. Early in the fourth quarter, Dana connected with Zach Engstrom from 14-yards out on a perfectly executed and nearly unguardable fade play, which Engstrom reeled in one-handed. On the ensuing possession, Alta drove down the field unabated and Dana found Mata Hola on a play action roll-out from 2-yards out. The final dagger came when Davis whipped off another 50-yard run to put Alta up 35-14 with just under three minutes to go. The Alta Hawks improved to 3-0 and will face Timpview next week. Dixie, which has played bigger classification teams for the last three weeks, dropped to 0-3 on the season. The Flyers will play at Canyon View next week. For more pictures, quotes and insight from the game, see the Saturday Breakdown Saturday morning on St. George News.